HMSTrust's grants strategy reflects the legal parameters of the will, Helen's philanthropic preferences and the prime source of her legacy which was regional Victoria. Within these boundaries, the Trust's grants strategy is continuously evolving as it responds to changes in social needs, legislation and sector trends. Eligibility is a fundamental prerequisite for funding and an applicant is required to meet a set of funding criteria specific to HMSTrust. FY17 was the fourth year of the Trust’s matrix-based structure. It has enabled the Trust to work more strategically, with greater efficiencies and to greater effect. The 5 x 5 matrix was developed to be an easy reference for grantseekers. 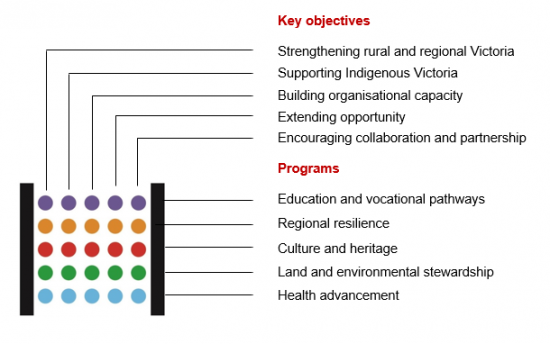 The columns represent the Trust’s five key objectives and the rows, the Trust’s five programs. Please note the matrix shown here is relevant for all grants approved between 2014-2017. HMSTrust’s Grants Policy is reviewed every three years to ensure that our grantmaking remains relevant and effective in a rapidly changing social environment. In April 2017, a revised Grants Policy was implemented which will apply to grants approved from FY18. The Programs section of our website provides full details. Objectives: The proposed project is required to match at least three of HMSTrust’s five key objectives. Program and focus areas: The project must fall within one of HMSTrust’s five program areas and is required to address at least one of the selected program’s three focus areas, which define the Trust’s areas of interest. The colour-coded HMSTrust matrix has become a standard feature in all our online case studies. It is a simple device that highlights the objectives and program that a particular grant addresses. An analysis of grants data over the last six years highlights the impact of the HMSTrust matrix on the quantity and quality of applications received. 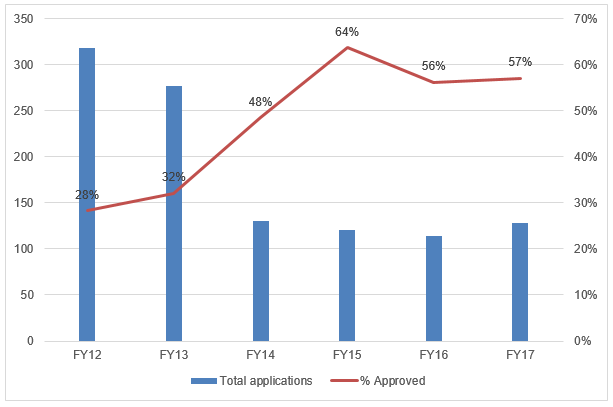 We have dramatically reduced the number of applications that do not match the Trust’s areas of interest by 64% and effectively increased the approval rate from 28% in FY12 to 57% in FY17. A direct impact of this initiative is that our Grants staff are now able to undertake more thorough due diligence, increase engagement with grantees and develop greater knowledge and understanding of the broader social sector. The increase in efficiency has also enabled us to allocate more resources into data management and reporting. This data along with sector consultation informed our new grants strategy.